Prior to ‘The Plague’ Demon released two good straight forward Hard Rock albums. So, when ‘The Plague’ arrived, with its very different approach and the songs more complex structures, metalheads were confused. Some were seen running for the hills wildly flailing their arms around and shouting unintelligible things, for this is not a Hard Rock album, but a slab of full-fledged Progressive Rock. The keyboards that got introduced on the previous album ‘The Unexpected Guest’ take a more prominent role here, up to the point that they sometimes push the guitars off centre stage. While such a use of keyboards isn’t a sure-fire way to create great songs, in this case they certainly help to augment the sense of drama of this pessimistic tale about war, disease and mankinds’ final downfall, for not only is this a Prog album, on top of that its also a concept album. That must have brought quite a few metalheads in a catatonic state as well (if they weren’t already flailing their arms around in the hills). But the fortunate few that managed to keep their mental assets intact might have noticed how the album cleverly changes moods. Sometimes it sounds defiant, sometimes melancholic, and quite often there’s a depressing feeling of despair and a sense that no matter what we do, we are but mere puppets in the hands of fate. 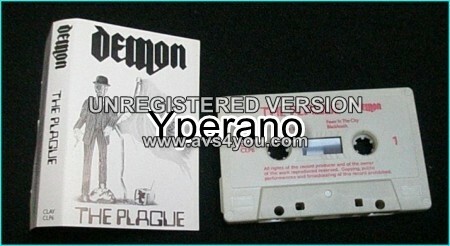 Demon has released ten or so albums to date, but ‘The Plague’ still stands as their most ambitious and most complete (*). So I think the only reason why it met with such hostility can only come from the fact that it isn’t what most people expected and they couldn’t make the mental leap. The end result was that this Progressive masterpiece simply got dismissed as a failed and pompous Hard Rock album, which it totally isn’t. “Pearls for swine”, I believe the expression is. I remember sitting in my room – aged eleven – and listening to Tom Russell’s Rock Show, as was standard procedure for many rock fans in the Glasgow area. He introduced ‘The Plague’ by Demon and, when the dark menace of the opening riff blasted from my speakers, every hair on my body stood on end. It still happens today when I listen to that track at high volume. Quite honestly, it is one of the heaviest and most phenomenal songs ever written – easily as good as anything by renowned riffmasters Black Sabbath or Deep Purple. My worry when an album starts out with such a knockout track is that the only way may be down for the rest of the material; this is not the case with this album, which starts as it means to continue – with beautiful keyboard melodies, well-defined and original guitar riffs, and the soulful, majestic power of Dave Hills voice. My personal favourites are the sonicly gorgeous ‘Blackheath’ and the dark beauty of the title track. There is not, however, a weak point on the rest of the album, so you won’t have to worry about flipping past songs; this is one of the rare albums that is essential listening from start to finish. The remastered version provides additional material in the form of the original mixes of all tracks, which is interesting, since it allows the listener to hear the seeds from which the final polished product grew. Buy it, play it loud…its Demon at their best! Demon have often dealt with devil worship, hell and possession in their songs and thus became labelled as satanic metal. Their music is melodic, but heavy, and the album the plague deals with corrupt politics and the aftermath of a nuclear war. The lyrics are powerful but the vocals are crisp and clear unlike some modern metal bands. This is an excellent album and I can not recommend it highly enough. This is a magnificent Album. Moody and sometimes a bit depressing but hey, the social comments are spot on, even now. Great playing from all concerned and fab vocals from Dave Hill.